“I look forward to working with the Indian community here to meet many of our objectives,” says Ambassador Harsh Vardhan Shringla. 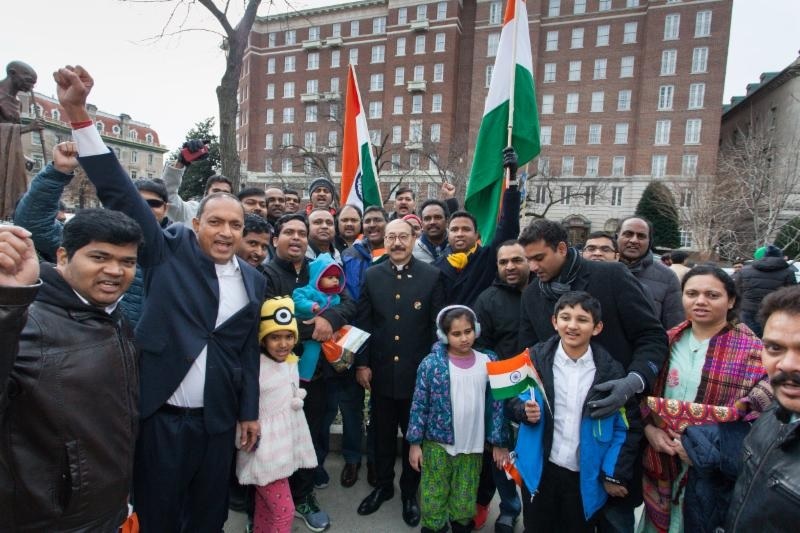 WASHINGTON, DC: Indian-Americans, proudly waving the tricolor, turned up in unprecedented numbers for the celebration of India’s 70th Republic Day at the Chancery in the capital city. In an interaction with reporters, the envoy called the 70th Republic Day celebration “a landmark event” which, he noted, “also coincides with the 150th birth anniversary of Mahatma Gandhi and the 550th birth anniversary of Guru Nanak Dev-ji. So, it’s an important event and we are very happy that we got such a tremendously supportive turnout of the community here,” he said. “I’m told that this is the highest turnout that has ever been seen and that too on a day which has record low temperatures,” he added clearly elated by the response from the diaspora.